I was quite skeptical when i came across this stall. 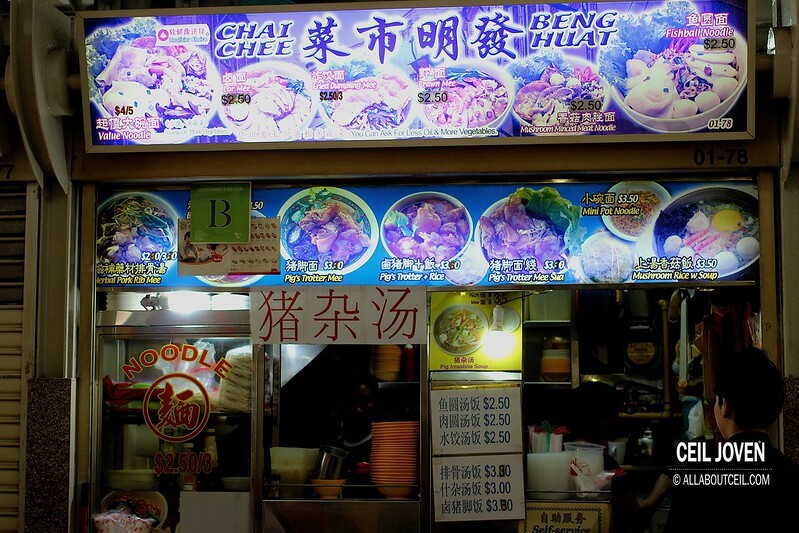 This stall offers Lor Mee, Fried Dumpling Mee, Prawn Mee, Mushroom Minced Pork Mee, Fishball Mee, Herbal Pork Rib Mee and Pig's Trotter Mee / Mee Sua. And, that is not all. They also serve Mushroom Rice with Soup, Fishball Soup with Rice, Meatball Soup with Rice, Pork Rib Soup with Rice, Pig's Trotter with Rice as well as Pig's Organ Soup. I stood there for a moment and still went ahead to order after the initial hesitation. There was 2 customers right in front of me and one of them ordered 3 bowls of Mushroom Minced Pork Mee. I decided to try it as well. I was greeted by the Uncle. He looked up while cooking and asked for my order. I placed an order of Mushroom Minced Pork Mee with extra chilli added. The Uncle asked for my choice of mee kia or mee pok. 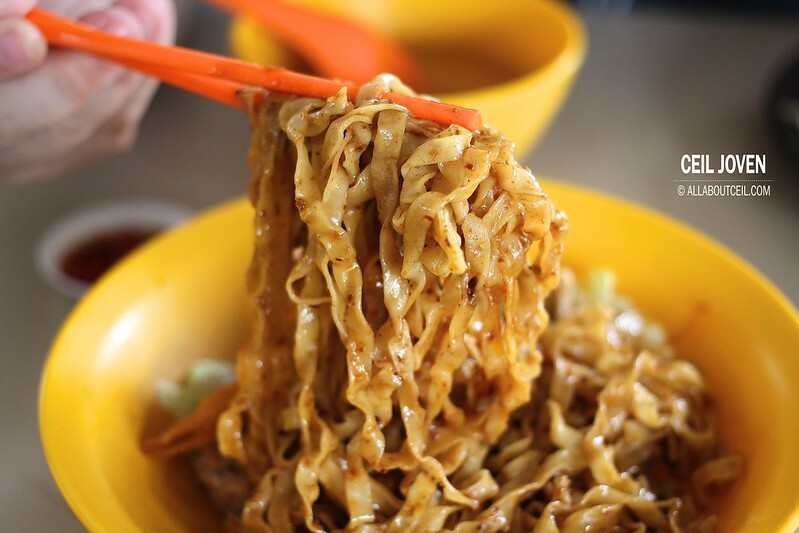 I picked mee pok over mee kia. It was served in minutes. Auntie placed it on my tray. The menu board indicated its price as $2.50. 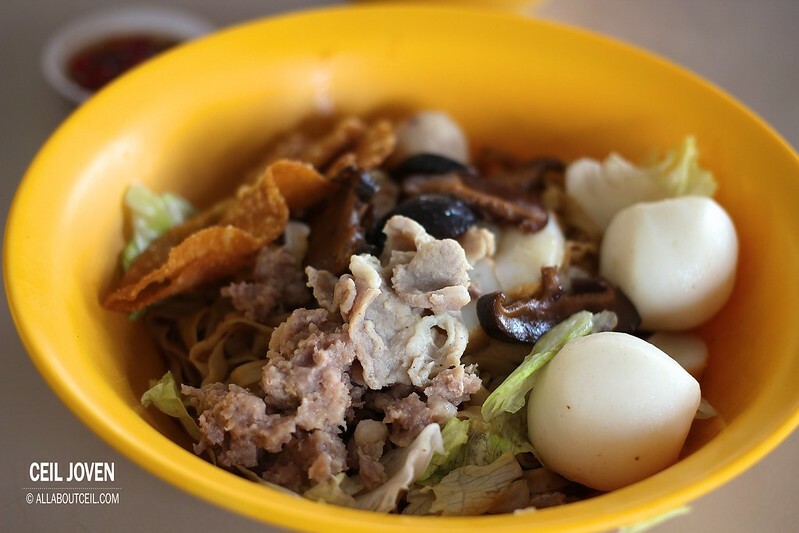 I was a little doubtful as that bowl of mee pok served with various ingredients including a fried dumpling. I asked the friendly Auntie for a confirmation before paid the $2.50 to her. I went through the ingredients again when i gotten back to my table. 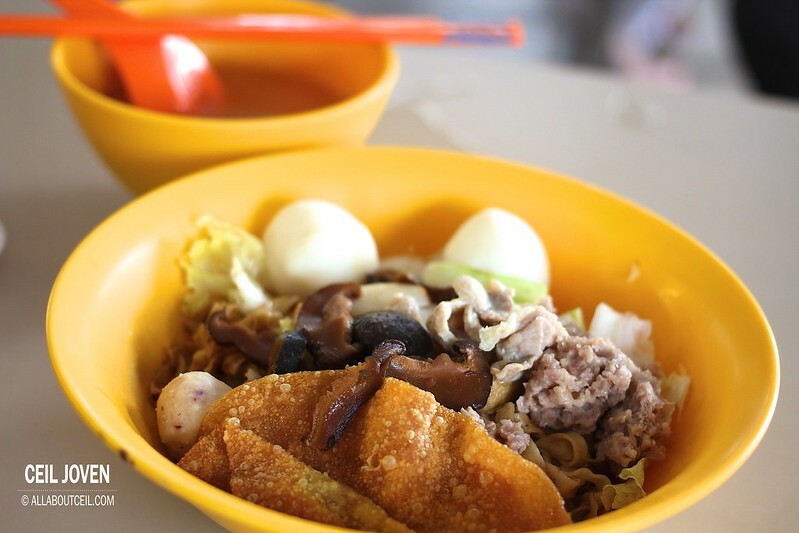 Such a $2.50 bowl of Mushroom Minced Pork Mee got a fried dumpling, 2 pieces of fishball with a meatball, braised mushroom, slices of lean meat and fishcake with bit of minced meat and some vegetable. The portion of mee pok was rather substantial too. I would think this bowl of noodle is indeed value for money as it is getting difficult to find a worthy meal at $2.50 these days. I tossed the mee pok well with the amount of chilli and sauce underneath. I took a mouthful quickly. My first thought was the taste seems to be quite different from most of the Mushroom Minced Pork Noodle that i have eaten. The chilli paste has got an intense flavor of Spicy Dried Shrimp Sambal. A common name for it is Har Bee Hiam. With an extra amount of it added, it made the level of spiciness to be quite distinctive but not overwhelming. 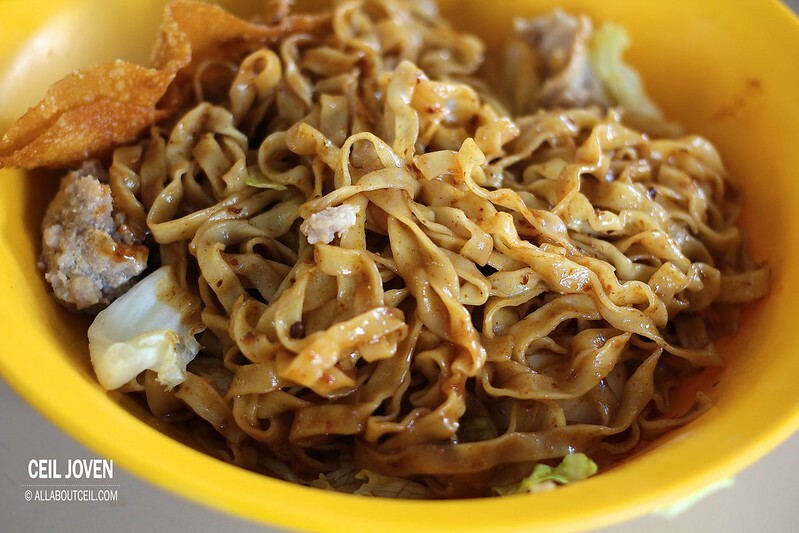 The mee pok was perfectly cooked too. It has got the delightful springiness coupled with the desired softness. A bowl of soup served along with it. The soup has a slight taste of sweetness derived from Pork. I would think this stall is a good option for a worthy meal. Block 29 Bendemeer Road #01-78 Bendemeer Food Centre SINGAPORE 330029.